Weber Genesis BBQs - The gas grill that revolutionised grilling! THIS PAGE IS NOW OUT OF DATE DUE TO NEW GENESIS II BBQ. The best selling Weber gas barbecues - Weber Genesis BBQ range has just got better with their new features and funky colours. Designed for life the Weber Genesis barbecue models all come with an amazing 10 year guarantee. Gas barbecues are everyday heroes - You come rushing home from work. Your family is hungry, and there is little time, but you don't just want to feed them anything. With the press of a button the gas barbecue is lit, and a delicious meal is soon ready - with all the atmosphere and great taste that goes with barbecuing. It is that easy with Weber's gas barbecues. When Weber, at the beginning of the 1980’s, decided to invent a new gas barbecue nobody knew that the result would become a true BBQ icon. Today the Genesis is one of the most beloved gas barbecues with its stylish modern design, innovative features and user-friendliness. Flashback to 1985 - a year that marks a milestone for every Weber enthusiast. That year Weber introduced a new gas barbecue - a barbecue nobody had ever seen the likes of before, and that set new standards for what to expect of a gas barbecue. The series got the name Genesis and with this new barbecue Weber also introduced another new revolutionary invention, the Flavorizer Bars. An invention that changed gas grilling forever. Before then the issue with gas barbecues was that people often experienced flare-ups and that the food did not taste like on the charcoal barbecue. But when Weber's engineer, Erich Schlosser came up with the idea of the Flavorizer Bars that issue was fixed: When the grease and juice felt down on the bended metal bars placed over the burners a small amount of smoke was created-enough to make food on the gas barbecue taste like classic barbecued food. Furthermore the bars prevented flare-ups and the burner system made it possible to grill both at direct and indirect heat. Combined with a new innovative design and features an icon was born. Through the years the Genesis has been updated and new models have joined. Today you can get models with and without side burner, with and without Sear Station - and you can upgrade it with a rotisserie, GBS accessories, smoker box and much more. Making it possible to do all sorts of food on the barbecue. 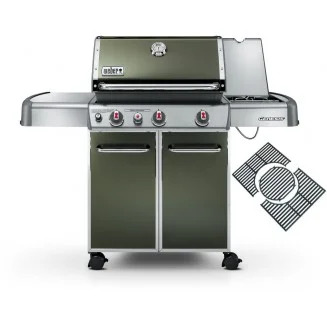 Weber Genesis BBQs are equipped with various features; front mounted control knobs, side burners and a new Sear Station Boost burner which allows you to flash sear steaks to perfection. The E-330 range now comes equipped with the Weber Cast Iron Gourmet Grate. Some models are constructed in stylish stainless steel. You may never want to cook indoors again! There are now 2 models in the Genesis line up Weber Genesis E-330 (Black, Smoke, Crimson) and the Weber Genesis S-330 stainless steel barbecue. We are often asked what are the difference between these models, so we have decided to write up a Weber Genesis Comparison Guide for you. Why is the Weber Gas BBQ Cooking System so good? Weber's legendary cooking system is the heart and soul of every gas bbq Weber make. It’s the reason Weber BBQs perform the way they do, and why they last so long..
What gas do I use with a Weber Genesis BBQ? You need to use Calor Patio Gas (propane) or similar. The 5kg bottles fit nicely inside the cabinets of the Weber Genesis barbecue hidden from view. The larger 13kgs gas bottles have to be stood to the side or behind the Genesis barbecue. The regulator on Weber gas barbecues is a 27mm clip on version, which is very easy to use. The Weber Genesis E-330 gas barbecues are available in three high quality colour finishes - Black, Smoke and Crimson. With great Genesis performance this barbecue suits every garden. 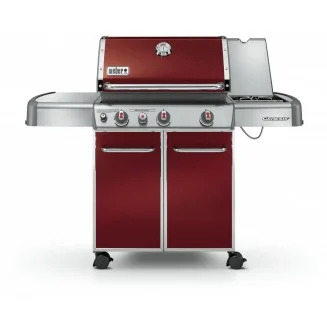 The Genesis E330 bbqs come fully equipped with 3 stainless steel burners, side burner with protective lid, integrated sear station, front mounted control knobs, Weber's Cast Iron Gourmet System Grate, 6 tool holders, thermometer, electronic ignition system and porcelain enamelled Flavorizer bars for the perfect barbecue taste. The Weber Genesis E330 bbq range now comes equipped with the Weber Cast Iron Gourmet Grate system. The Weber Gourmet BBQ System has a 30cm removable central section. For use with the Weber Gourmet BBQ System accessories. Such as the Pizza stone, Poultry Roaster, Sear Greate, Griddle, Dutch Oven and even a Wok! For more information on the GBS click here. 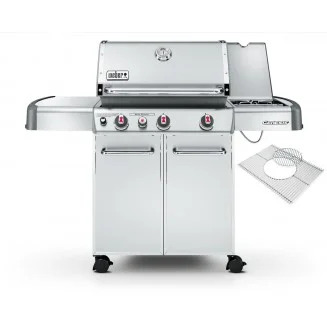 Compared to the Weber Genesis E310 BBQ (no longer produced) the Genesis E330 models feature a high powered Sear Station which allows you to flash sear steaks to perfection. Plus a side burner to the right hand side of the bbq hood with a protective lid, neatly enclosed within the right side table! The side burner is ideal for cooking vegetables, preparing a pepper sauce for your barbecued steak. The Weber Genesis S-330 is top of the Genesis barbecue range boasting the same awesome features and design as the Weber Genesis E-330 barbecues but with a higher quality stainless steel finish. Along with the new Gourmet BBQ System stainless steel cooking grates and stainless steel flavourizer bars, which have a better life expectancy. The S-330 comes with the Weber Gourmet BBQ System stainless steel grate which has a 30cm removable central section. For use with the Gourmet BBQ System accessories. Such as the Pizza stone, Poultry Roaster, Sear Greate, Griddle, Dutch Oven and even a Wok! For more information on the GBS click here. The other main differences between the Weber Genesis S-330 BBQ and the E-310 is that the Weber Genesis S-330 has a side burner, neatly enclosed within the right side table! The side burner is ideal for cooking vegetables, preparing a pepper sauce for your barbecued steak. Plus you also get the fantastic high powered integrated sear station, which allows you to flash sear steaks to perfection. Ok so lets get down to the nitty gritty and put these awesome Genesis barbecues side by side and see what they've got to offer you. Buying a Weber Genesis barbecue is an investment, as Weber provide a limited guarantee of up to 10 years you can be assured that in the unlikely event that something goes wrong you have the backup of Weber's fantastic customer service.